Look for dolphins during Savannah scenic cruises. Savannah sits on the Savannah River, not far off the Atlantic Ocean. As the largest port in the state of Georgia, it is intricately linked to the water. That’s why many guests of our Savannah Vacation Rentals find scenic cruises to be a good way to explore the area. Scenic cruises won’t get you close to any of the 22 historic squares for which Savannah is renowned. They will, however, provide stellar views of the waterfront and historic waterways. Seen from afar, the beauty of Savannah shines. Historic architecture. Graceful, moss-draped trees. Lovely. 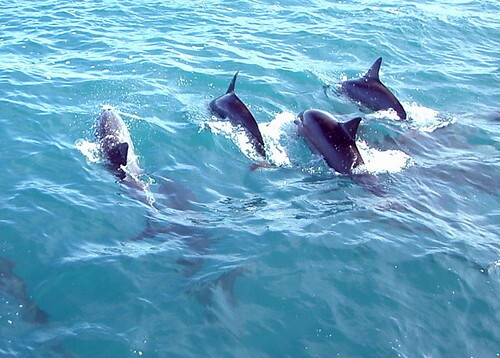 Dolphin Magic Tours. Board the vessel at River Street and cruise out towards Tybee Island. Fort Jackson, Fort Pulaski, Cockspur Island, lighthouses…. you’ll see it all. This ship is in search of dolphins, and dolphin sightings are guaranteed. Savannah Riverboat Cruises. A variety of cruises are available, from Harbor Sightseeing Cruises to Weekend Moonlight Cruises. You can learn about the Civil War or you can dine and dance. Getting out on the water is always fun, no matter where you are. Seeing Savannah from the Savannah River, circling Tybee Island, or heading to big water in search of dolphins can make your Savannah vacation that much more unforgettable. Give it a try the next time you stay at one of our Savannah Vacation Homes.